From producing approximately one in every eight barrels of the world’s crude oil supply to developing breakthrough energy technologies, Saudi Aramco is driven by its core belief that energy is opportunity. In the coming decades, more and more energy from many different sources will be required to meet the needs of a rapidly advancing world. Global oil demand alone is expected to rise from roughly 93 million barrels per day (mbpd) currently to 111 mbpd in 2040. Making smarter choices about how one produces, uses, and capitalises on such an important resource as energy is vital to everyone. On the frontiers of energy and innovation, groundbreaking work is under way to unlock the full potential of the available energy resources. "Because we invest so much in energy – and because energy makes so much possible – we know how valuable it is. For us, the real value of energy lies in its potential to serve the needs of human development and progress. Doing so with the most impact requires not only the energy of our petroleum resources, but also the energy of our people," says Saudi Aramco in its 2014 Annual Review. Every day, the people of Saudi Aramco are hard at work applying their expertise and ingenuity to create solutions to some of society’s most pressing challenges. From developing breakthrough technologies that boost oil and gas recovery to helping children acquire the skills they need to participate in the knowledge economy, the firm’s people go home at the end of each day knowing they made a real difference. That’s because Saudi Arabia believes energy is opportunity. Whether it is the energy of its resources or the intellectual and creative energy of its people, Saudi Aramco is focused on harnessing their full potential. This belief is at the core of everything it does. Saudi Aramco proudly cherishes the values and the successful business practices that have made it one of the world’s leading integrated energy and chemicals companies. But the company is even prouder of the opportunities it enables for others. Saudi Aramco is engaged in a corporate transformation designed to move its business forward in a way that balances commercial success with the ability to create ever more opportunities for the people whose lives it touches. With that in mind, its business strategy is built upon a basic underlying principle: the firm amplifies the positive effects of its commercial activities for the benefit of the greatest number of people possible. Going by the firm’s strategic intent, in 2020, Saudi Aramco is the world’s leading integrated energy and chemicals company, focused on maximising income, facilitating the sustainable and diversified expansion of the kingdom’s economy, and enabling a globally competitive and vibrant Saudi energy sector. Guided by the strategic intent, the company’s business strategy has five key, outward-facing focus areas. Each one is an area where the company is determined to improve commercial performance to provide the most opportunity possible for its stakeholders. The company’s ability to reliably deliver its products to customers enables it to play a leading role in supplying world petroleum markets and in making sure that economies around the world have the energy essential for prosperity. Its legacy of commitment to its customers makes it possible for companies to invest with confidence in projects that grow their businesses, creating countless jobs. Aramco intends to go beyond leading in size and scale to achieving excellence in every aspect of its upstream operations. This means innovating and applying leading-edge technologies in exploration and reservoir management to discover new fields and increase recovery in its producing fields. The company’s maximum sustainable oil production capacity will continue to be maintained at 12 million barrels per day (mbpd) while it also substantially increases its gas production. Unconventional gas will make a significant contribution in its plans to increase overall gas production. The company’s capital investment programmes in oil and gas production capacity are powerful indicators of its commitment to enable the sustainable economic growth of the kingdom, support market stability, and efficiently meet domestic energy demand while also meeting the global call on its products. Saudi Aramco’s greatest opportunities for growth and diversification will come from the steps it is taking to capture unrealised value and create additional value from every hydrocarbon molecule it produces. Pursuing this strategy will open up new opportunities for organic growth as well as strategic partnerships with other leading global firms at home and abroad, create more business for service and materials suppliers in local supply chains, and generate new jobs. Even as other petroleum companies are scaling back, Aramco is moving steadily forward to build additional refining capacity. It is also growing its global chemicals business as well as its trading and marketing businesses. The expansion of its downstream activities will significantly increase Aramco’s global presence, creating greater sustainable competitive advantage through increased scale. It will also better position it to take advantage of crude oil placement for an optimal balance of geographic exposure between Asia, Europe, and North America. Though Saudi Aramco is the main driver of the Saudi economy, it has always leveraged the full range of its skills and capabilities to expand the types of opportunities it enables. Aramco continues to take on important infrastructure and public works projects. It also actively seeks out possibilities at the intersection of its business activities and the kingdom’s needs where it can generate even more economic development and diversification. Saudi Aramco examines its activities for potential reach and impact and then leverage those wherever possible to create opportunities beyond its immediate business objectives. 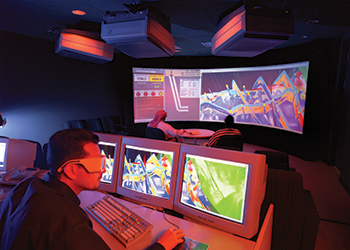 Whether by enabling private sector job creation and training, acting as a catalyst for the localisation of the kingdom’s energy services sector, adding value to its downstream products, or championing energy efficiency, the company puts the energy of its people, its unique expertise, and its resources to work to create new opportunities for the people of Saudi Arabia. People’s lives will be changed for the better by breakthroughs in research domains such as providing more reliable access to affordable energy, reducing carbon dioxide (CO2) emissions, innovating to realise more fuel-efficient vehicles, creating next-generation materials that make consumer products lighter and stronger, and conserving water resources. Aramco is working to make these ideas a reality. Such technology targets would overstretch even the best research lab or industry contributor. This is why Aramco has adopted an open network innovation model that integrates talent, capabilities, and ideas from around the world through strategic research alliances and global research centres and offices. When it comes to innovation, Saudi Aramco knows a good idea can come from anywhere. Saudi Aramco collaborates and partners to transform ideas into sustainable solutions to provide long-term value for the greatest number of stakeholders. World-class ambitions require world-class talent. 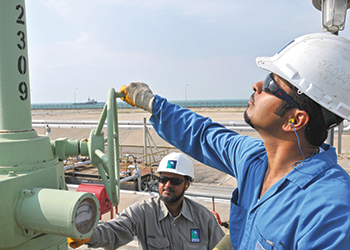 Aramco attracts people who seek the opportunity to do the best work of their lives. Its ethos of providing the greatest number of opportunities for the greatest number of people ensures that its employees are engaged in meaningful projects with the potential for impact on a global scale.